A key parcel of Riverfront 47, the 47-acre former scrapyard slated for redevelopment in Sharpsburg, Aspinwall and O’Hara Township. 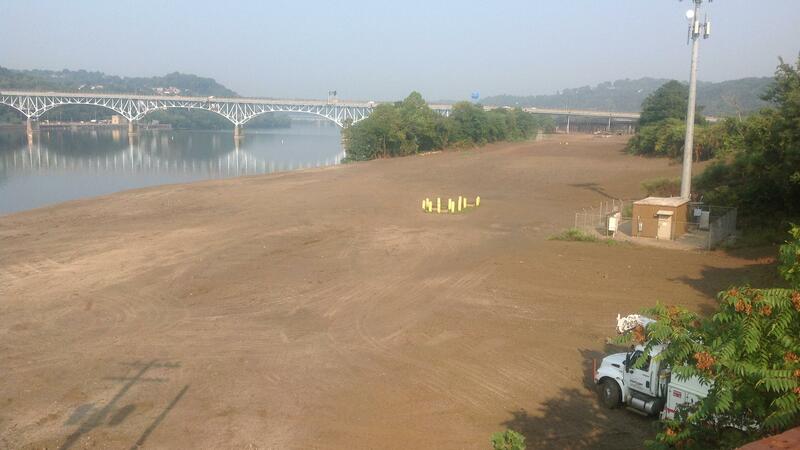 This site is close to the Highland Park Bridge and the Aspinwall business district along Freeport Road. A lone crane wielding an industrial magnet on a dusty stretch of land in Sharpsburg hints at major changes to come along a mile and a half of land along the Allegheny river. On a summer Tuesday morning, the crane and some remaining work crews were cleaning up and removing the last traces of scrap metal of the former Azcon Metals property that have been the dominating feature of a 47-acre stretch of riverfront that runs from Sharpsburg, through Aspinwall and into O’Hara Township. Now, the removal of all the scrap metal along with 20 buildings on the site are part of sales agreement between a local group called Riverfront 47 LP and Azcon’s owner, New York-based Blue Tee Corp. This week, Riverfront 47 LP closed on buying the Azcon property from Blue Tee for $5.34 million. For the first time in generations, the final sale will open up what may be the largest tract of land along the Allegheny River in western Pennsylvania for new development. The deal also marks a major step up in ambition for Aspinwall residents Susan and Currie Crookston, firsttime real estate developers who were motivated to pursue the Azcon property after they worked with the community of Aspinwall to buy an eight-acre marina and redevelop it into a riverfront park that neighbors the site. They won’t be taking on 47 acres alone. After generating support from the three municipalities the property runs through, the Crookstons are now partners in Riverfront 47 LP with the Mosites Co., the downtown Pittsburgh-based developer that played a fundamental role in the redevelopment of East Liberty through its East Side project. The Crookstons were introduced to Mosites after meeting with officials of the Heinz Endowments. Susan Crookston said she was impressed with the 2011 Global Award for Excellence the development company won for East Side, a project that includes Whole Foods and Target stores along with a new 360-unit apartment complex now under construction. She said they began seeking a partner after they put the property under option last year. It’s a level of real estate experience the Crookstons realize they don’t have, despite their entrepreneurial experience. The couple met at the University of Virginia, where they both earned masters of business adminstration degrees. Susan Crookston worked as a management consultant and for Procter & Gamble, and was the president of the Fox Chapel District Association, a community organization that engages in various community sponsored beautification projects in Aspinwall and its neighboring communities. Currie Crookston, a former U.S. Navy Seal, was most recently the CEO of PetDx, a company that provides CT and MRI services to veterinary hospitals, and was a marketing director for Medrad. Susan Crookston said the first and only specific plan for the site so far is to extend a trail through it, encouraging public access to a riverfront site long barred by its industrial use. Beyond that, the Crookstons and Mark Minnerly, director of development for Mosites, were noncommittal about what kind of commercial projects they intend to pursue. Despite getting an inquiry for a corporate headquarters, and against speculation that plans are already in place, Crookston said Riverfront 47 offers plenty of options for commercial development. “I think the site is so large that it offers a lot of potential to do a lot of things,” she said. The site’s potential will take time to realize, since Riverfront 47 LP will need to build out the site’s utilities, roads and other infrastructure, an undertaking they expect will be expensive. Preceding the sale, the Crookstons applied for a Redevelopment Assistance Capital Program grant through the Pennsylvania Department of Community and Economic Development. But Riverfront 47 will get started on redeveloping the site with a fresh start in a location fully within the Fox Chapel School District, and connecting two parks. Blue Tee, according to Susan Crookston, originally planned to sell the property to another scrap operator at a price of $15 million to $20 million, when they failed in their first bid to buy the land. But a deal fell through and the site’s viability as a scrap yard took a hit when United States Steel Corp. (NYSE: X) closed its McKeesport tube products plant that was Azcon’s key client in the region, said Susan Crookston. That led Blue Tee to come down on its price for the land, she added. A key component that helped facilitate the deal’s $5.34 million price was the value of the scrap on the property, which Blue Tee was able to remove and sell off, adding to the proceeds from the real estate sale, while cleaning up the site itself. Crookston said the clearing of scrap from the property, excluding a piece of industrial machinery left as an architectural feature, represented a value of about $2 million in site preparation they won’t have to do themselves. Susan Crookston praised the quality of the operation by Azcon and Blue Tee. Currie added the vast majority of the land is not in the flood plain. There are narrow stretches of the property that might be a challenge to develop but the rail line on the northern edge of the site also doesn’t block off the river, unlike other riverfront areas in the region. A tour of the property by the Crookstons in their minivan showed a few key access points along largely narrow roads. A road in Sharpsburg leads to a riverfront park in the community directly across the river from the Pittsburgh Zoo. It was a once-in-a-lifetime opportunity the Crookstons felt they had to take as they seek to re-establish a community connection to the riverfront as both a commercial venture and legacy for future generations. Susan Crookston emphasized the importance of the community support for the project, with the three municipalities through which the property runs working together to establish joint zoning for the site and expressing support for grant applications. It was a level of support she said was key in recruiting Mosites to the project. Tim Schooley covers retail, real estate, construction, hospitality, arts and entertainment, and government. Contact him at tschooley@bizjournals.com or 412-208-3826. ← Previous Previous post: The Google effect: How has the tech giant changed Pittsburgh’s commerce and culture?